WASHINGTON DC–U.S. Attorney General Eric Holder has appointed Vanita Gupta Principal Deputy Assistant Attorney General and Acting Assistant Attorney General for Civil Rights at the U.S. Justice Department. 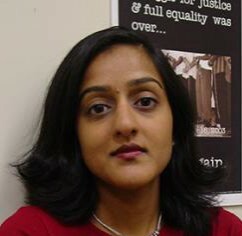 Gupta began her legal career at the NAACP Legal Defense and Education Fund (LDF), after graduating from New York University Law School and Yale University. LDF is the leading civil rights law firm and a separate entity from the NAACP. Her first case at LDF was to challenge the wrongful convictions of 40 Black Americans in Tulia, TX, who were convicted of selling drugs solely on the testimony of one White undercover officer with a history of racial hostility and misconduct. Her clients were eventually pardoned by Texas Governor Rick Perry and received six million dollars in a monetary settlement for their civil rights violations. Gupta has received numerous awards and honors for her outstanding work, including the Reebok Human Rights Award. “(Gupta) is a rock star in the civil rights bar. We are al extraordinarily lucky that Vanita has chosen to serve her country,” said Leslie Proll, director of LDF’s Washington office.